This portable drinking water filter is compact, attractive and extremely effective for apartments and non-permanent installations. Made in the USA by CB Tech, a health-conscious leader in the water filtration industry. CB Tech has repeatedly initiated breakthroughs in carbon block technology for drinking water filters for almost 40 years. NSF certification verifies its outstanding filtration ability against more than 60 types of contaminants. By changing fittings and adding a faucet, you can easily convert this high quality filter into a permanently installed under sink drinking water filter. You can also convert it into an emergency drinking water filter (with the additional purchase of the emergency pump) to have on hand in case of an unexpected breakdown in your municipal water supply. 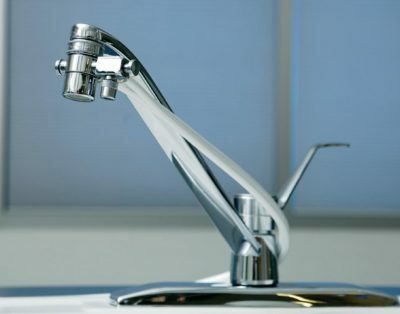 The unit comes with a diverter valve which is attached to the end of your tap, making it easy to toggle between your choice of filtered or unfiltered water. The dual return feature gives you flexibility about where you position the water filter – it does not have to sit right beside the sink because a discrete second hose brings filtered water back to your tap where you dispense it. NOTE: Certain types of pull-out kitchen faucets won’t accommodate a diverter valve (required for counter top installation). The cartridge in this filter is called the CBTVOC. It is a specially activated carbon block filter certified by NSF to reduce a wide range of contaminants including those known to occur in Metro Vancouver tap water. The CBT-VOC filter cartridge accomplishes this by directing every molecule of water through microscopic pores (0.5 micron) and by utilizing the triple-action protection of mechanical filtration, electrokinetic adsorption, and physical adsorption. The filter is also certified to reduce chloramine – a challenging (to remove) disinfectant used in communities like Victoria, Abbotsford and Mission, BC. The CB Tech cartridge uses advanced solid carbon block filtration technology that combines mechanical filtration, electrokinetic adsorption, and chemical/physical adsorption. For contaminants reduced by adsorption, filter life/capacity is 750 gallons. However, filter life will vary in proportion to the amount of water used and the level of impurities in the water being processed. 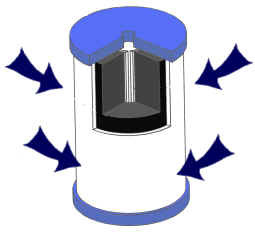 The CBT-VOC cartridge is engineered so that contaminants removed by mechanical filtration, such as turbidity, will cause the flow rate to decrease – an indicator that the cartridge should be replaced. We recommend changing it when the first of the following occurs: (a) after approximately 9 months of use; (b) 750 gallons of use; (c) the flow rate diminishes. watermatters provides a free email reminder service to notify you when it’s time to replace your cartridge. Drinking water filters are for cold water use only. Use only on municipally treated water or other supply known to be microbiologically safe. Anmore, Bowen Island, Burnaby, Coquitlam, Delta, Langley (City), Langley (Township), Maple Ridge, New Westminster, North Vancouver (City), North Vancouver (District), Pitt Meadows, Port Coquitlam, Port Moody, Richmond, Surrey, Vancouver, West Vancouver.